Both Mrs Earth-Prime and I had read reviews of the Venom movie before going to see it yesterday . . . and we weren’t disappointed. The film is, simply put, a mess. It doesn’t know whether it wants to be funny, a dark superhero film, or a promo for a video game tie-in. I have a lot of time for Tom Hardy and will happily watch him in most things, but here he’s just stumbling around waiting for the next CGI set piece to come along. There are a few flashes of what could have been, particularly when he’s having what appears to outsiders to be having a one-sided conversation, but those flashes are rare. The rest of the cast are simply bystanders who are used as cannon fodder or stock characters that don’t really do much. I won’t rehash the plot because – like most of Marvel’s origin films – it boils down to good guy with power X ending up fighting bad guy with power X and guess who wins? None of the action set pieces are particularly noteworthy and the climactic fight between Venom and the bad guy is just one long round of fast edited CGI goop fighting against another CGI goop. Oh, and there’s a mid-credits scene with a fairly big-name actor who wears a wig that looks it came from a Happy Meal who, presumably, is being set up as the bad guy for the next film. Honestly, I think I enjoyed the trailer to Spider-Man: Into the Spider Verse more. Venom gets 1 poorly made boys’ Halloween costume out of 5. 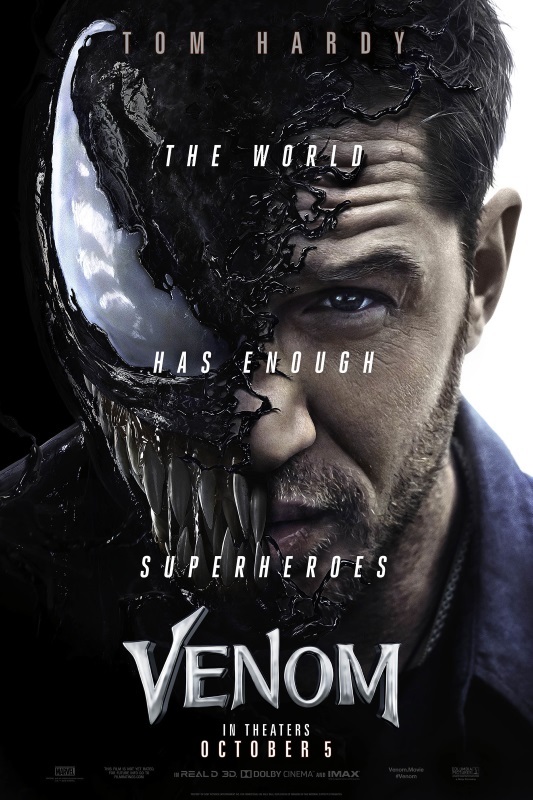 Posted on Saturday, October 6, 2018 Friday, October 5, 2018 by GaryPosted in ReviewTagged Venom.